Unit 2 reactor problem is the latest in a long string of troublesome safety issues. 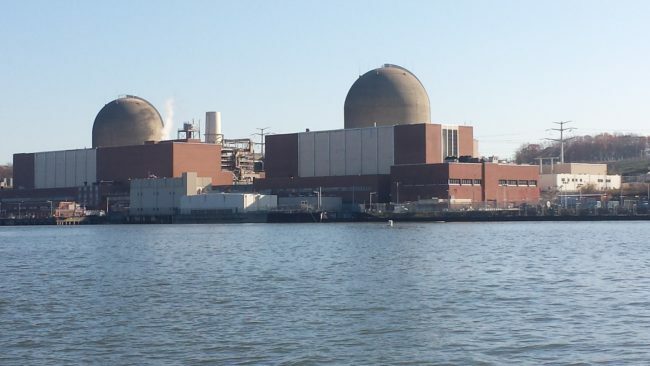 Last week, Entergy discovered a significant safety problem that could prevent safe restart of Indian Point 2, which is currently shut down for refueling. A visual inspection of the reactor vessel head found boron deposits on the exterior showing that acidic coolant is leaking out of the highly pressurized reactor vessel. When there is a leak in the reactor head, acidic steam escapes, condenses, then boric acid drips down onto the unprotected exterior of the reactor head. When the water in the acid boils off, it leaves boron behind. Left uncorrected this can lead to serious corrosion in the vessel head because, unlike the inner wall, the exterior of the reactor head does not have a corrosion-resistant stainless steel liner. For this reason, federally mandated technical specifications require reactors with any leakage across the pressure vessel boundary to shut down within at most 10 hours. Indian Point almost certainly violated this requirement. In 2002, a similar problem at the Davis-Besse plant in Ohio that went uncorrected resulted in extremely serious corrosion that created a major nuclear accident risk. The likely, but as yet unconfirmed source of the leakage, is cracking of the stainless steel liner that protects the reactor head. Through-wall cracking in one of the 97 sleeves provided for movement of the control rods probably allowed the acidic coolant to escape and attack the outer wall of the reactor head. Instead of replacing the head, Entergy has proposed to fix the problem using a welding technique that has been used at other reactors. Pleading poverty, Entergy has asked the federal safety regulator (the NRC) approve its proposed fix and allow restart by April 10-14. The NRC has said that it needs Entergy to document the proposed fix and will review Entergy’s proposal before it will allow the reactor to restart. Is the proposed fix for the identified cracking adequate? Have the other 96 similar sleeves been inspected to determine if they could develop similar cracking? Will periodic inspections for similar issues be required during operation? Was the boron on the head a result of leakage caused by the cracking? Until these questions are fully answered in the public record by Entergy and the NRC, Indian Point 2 should remain shut down. Entergy’s desire to make a profit should be disregarded by the NRC, whose sole mandate is to ensure public safety.